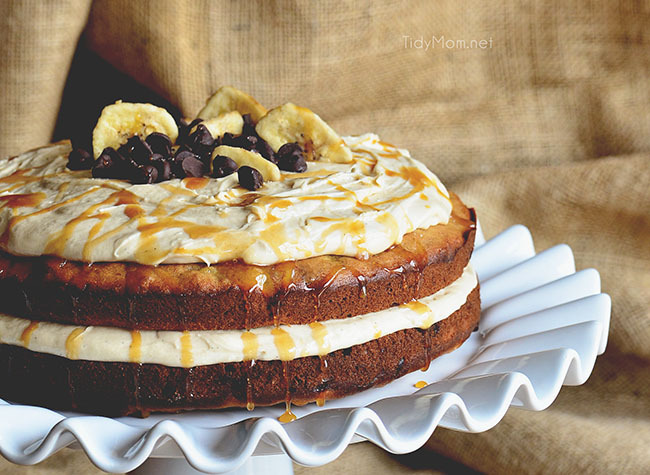 Chocolate Chip Banana Cake with Salted Caramel Frosting. A moist dense layered banana cake with chocolate chips goes over the top when layered with salted caramel buttercream for a cake any banana bread lover will go wild over! My family loves banana treats just as much as I do, so it was no surprise that Allison asked for a banana cake for her 18th birthday cake! There’s a lot going on with this Chocolate Chip Banana Cake, but you’ll never notice because you’ll be busy polishing off one piece after another! If banana and chocolate chips weren’t enough in this recipe – I went and added a dash of cinnamon. The cake is a rustic two-layer affair with a generous spreading of salted caramel buttercream in between and on top. 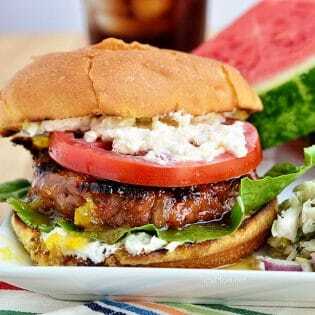 Deliciously easy and simple to put together. No fancy pastry tips or bags, just a simple knife or off-set spatula and a little wrist action. For the very best flavor, you will want to use very ripe bananas. To the point that they are heavy on the black speckles (almost black) and mushy. If your bananas are ripe but you are not ready to make your cake yet, you can prolong the life of overripe bananas a week or so by putting them in a plastic bag and storing them in the fridge, or you can keep them for months in the freezer. We always have a bunch in the freezer. I’m not really sure there is a whole lot of difference in banana bread and banana cake, but either way, get your fork ready because this one is a plate-clearing addiction that is sure to be a repeat offender of the best kind in your home. Are you a banana bread/cake lover? Just like when I make banana bread, this cake did not last long. I don’t think we’ve ever polished off a cake so fast! 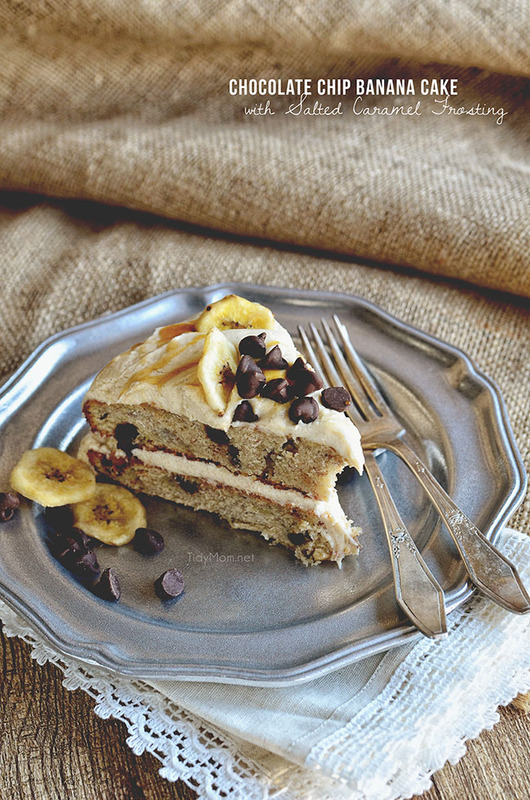 Like This Chocolate Chip Banana Cake Recipe? Pin It! A moist dense banana cake with chocolate chips goes over the top when layered with salted caramel buttercream for a cake any banana bread lover will go wild over! In a medium bowl, whisk together, flour, baking soda and cinnamon and set aside. In a mixer fitted with a whisk attachment (or using a hand mixer), cream the butter until smooth. Add sugars and eggs and mix until fluffy, then add mashed bananas and vanilla. Add half the dry ingredients and half the sour milk and mix just until combined. Repeat with remaining dry ingredients and milk. Fold in chocolate chips. Pour batter evenly into prepared pans and bake for 30-40 minutes. Let cakes cool in the pans 5-10 minutes. Turn out onto wire racks and let cool completely before frosting. Cream shortening and butter with electric mixer. Add ice cream topping, salt and vanilla. Gradually add sugar, one cup at a time, beating well on medium speed. Stop to scrape sides and bottom of bowl as needed. When all sugar has been mixed in, icing will appear dry. Add milk 1 tablespoon at a time and beat at medium speed until light and fluffy. To AssemblePlace one cake round on a plate, use an off-set spatula to spread half of the frosting over cake. Then place other cake round on top, mound remaining frosting on top and spread within an inch of the edge. Garnish with chocolate chips, banana chips, and caramel topping. 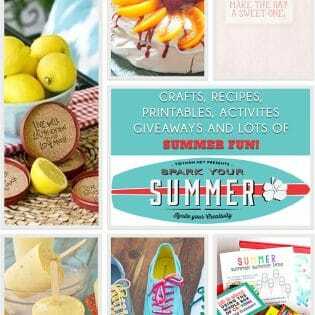 Spark Your Summer edition I’m Lovin’ It Linky Party!! Hello beautiful cake, please get inside my belly! And, now, I can’t get enough bananas so I am in lurve with this cake! Pinned! That frosting looks so crazy good!! LOVE it! My mouth dropped open when I saw this on Facebook! This is such a gorgeous cake with an incredible sounding combination of flavors! Happy 18th Birthday to your daughter! I see why your daughter asked for that cake, I want a slice too!! Love this cake! Happy Birthday to Allison! Yes there really is a lot going on with this cake….a lot of GOOD things! Holy cow, this is gorgeous! This cake looks wonderful. I love the sound of the salted caramel icing. You had me at banana. 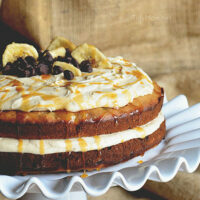 I love all banana desserts, and this cake is gorgeous!! Loving this cake idea! So many wonderful flavors! Pinned! Gorgeous and you had me at caramel frosting!! Oh my gosh, Cheryl… that is one gorgeous looking cake! Wow! And those photos of it are so good! Where has salted caramel frosting been all my life????? I could ice SO many desserts with it, but eating with a spoon sounds wonderful, too! Whoa. This looks awesome! Happy birthday to your daughter! This looks amazing! I love banana and caramel together! This is such a sunning cake and the flavor combo is awesome!! Happy birthday to your daughter! yum!! craving a slice now.. great flavour combo! thanks for providing the great recipe – it’s one i will be saving to recreate! 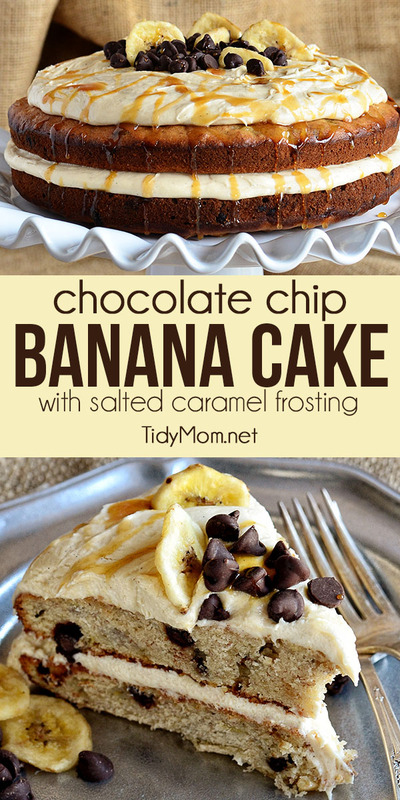 Love banana and chocolate combo and this cake is wonderful! How cool is this? I have a “birthday” request for a creamy banana cake — I’ve picked out the cake recipe already but wasn’t happy to see one recipe after another choose a cream cheese frosting which somehow doesn’t strike me as right. But caramel? I’m all over it! PS I’m a big fan of what I call “black bananas” — super-super ripe and very very sweet. I think that I may have drooled just a little bit when this popped up in my e-mail!! yum!! 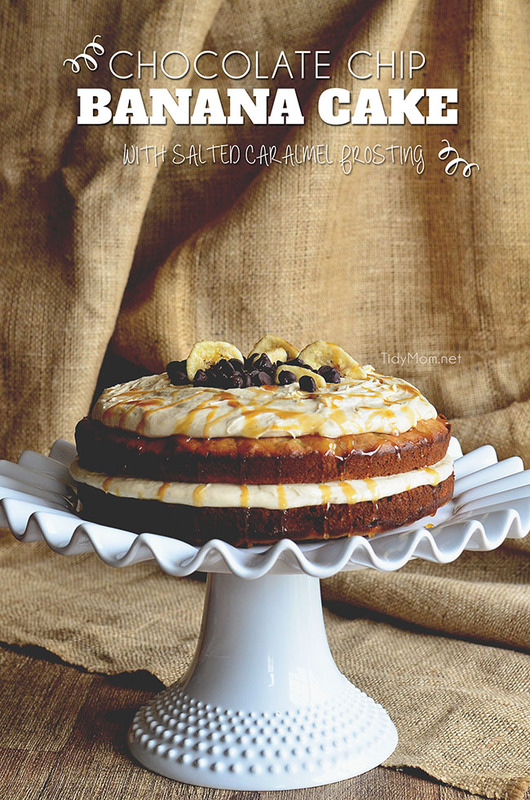 This looks amazing, I love banana bread and salted caramel…this combination just sounds incredible! this cake sounds so delicious! You make one gorgeous cake! Love the flavor combo here. Pinned. What a gorgeous cake! Love that salted caramel frosting! Oh my word! This looks sooooo good! I know what I am bringing to Sunday dinner next week! What a glorious looking cake!! I bet every bite was so so good! 🙂 Yum! That is one lovely cake. I love the caramel frosting and drizzle.